This book is a long autobiography of a complex man who coached in a simple method. It starts with Bill’s success as a High School multi-sport athlete and his early influences. Mickey Corcoran, a Lombardi disciple was Bill’s High School hoops coach. Mick played for Lombardi at St. Cecilia’s and passed on Lombardi’s motivational genius to Bill. Parcells played college football at Wichita State and after a good career got into college coaching. Though Parcells did not have great success as a college coach; it impressed me that Parcells studied the great college coaches. He studied Woody Hayes, Ara Parseghian, Bear Bryant, John McKay, Darrell Royal, Bo Schembechler and especially Bud Wilkinson. He was particularly interested in Wilkinson’s 34 Defense & his no-huddle high tempo offense. Parcells Philosophy of “Toughness, Toughness and more Toughness” was forming. He also was being sold on Defense & Ball Control Offense. He studied coaches in all sports. His favorite book was Bill Libby’s The Coaches and his best friend and confident was Bobby Knight. I don’t want to make this book review a mini-bio of Bill Parcells, I just want to point out somethings that I believe made him successful. Parcells key factors – TOUGHNESS. Defenders must tackle first. O. Linemen – long arms & wide butts. TB – big, bruising, punishing runner. The 34 Defense – designed to make OLBs Pass Rush Stars. NYG’s Lawrence Taylor changed the way the NFL played football. Parcells used LT the way Picasso used pastels. Parcells always stressed physical play and tackling. TURNING THE GIANTS AROUND – Bill’s first year as head coach of the Giants they finished 3-12-1 in 1983. Bill was on a very HOT seat. George Young, the GM, contacted Howard Schnellenberger about Bill’s job! Bill went over his mistakes, regrouped & went into 1984 as do or die year. Added some key guys and went to Chuck Knox’s ball control ground attack to control the clock. Controlling the clock is critical to turning a program around. Giants got to the playoffs and got to the second round. Giants lost in playoffs in 1985 but won the Super Bowl in Parcells’ 4th year! The interesting thing Bobby Knight won his second National Basketball Championship in 1987 the same year Bill won his first Super Bowl with the same emphasis: Toughness & Execution from repetition. Of course no bio of Bill Parcells could exist without Bill Belichick. It’s obvious the great team these two Hall of Fame coaches made. Together they won 7 Super Bowls. None bigger than Parcells second Super Bowl win vs the unstoppable Buffalo Bills. The Giants milked the clock & Jeff Hostetler hit some key passes to upset the Bills. This is a great blueprint for creating an upset. Of course the book doesn’t end there. Parcells turned around the Patriots, the Jets and the Cowboys before retiring. Parcells built his strategy around great defense and a simple easy to execute ball control offense. Simplicity of scheme makes players play fast. He always got “his guys” on the roster first. Guys that had the intangibles required to play “The Parcells Way” not the biggest or fastest but those tough SOBs with a chip on their shoulder and an axe to grind. You can win a lot of games with guys like that. I totally recommend this book. I had a hard time putting it down. 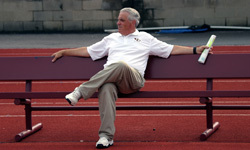 I enjoy reading about coaches in any sport & turn programs around and do it fast. Enjoy this outstanding autobiography. Parcells style wasn’t a lot of “Flash & Dash” but it was always effective. Enjoy the book.